This is part 31 of Categories for Programmers. Previously: Lawvere Theories. See the Table of Contents. There is no good place to end a book on category theory. There’s always more to learn. Category theory is a vast subject. At the same time, it’s obvious that the same themes, concepts, and patterns keep showing up over and over again. There is a saying that all concepts are Kan extensions and, indeed, you can use Kan extensions to derive limits, colimits, adjunctions, monads, the Yoneda lemma, and much more. The notion of a category itself arises at all levels of abstraction, and so does the concept of a monoid and a monad. Which one is the most basic? As it turns out they are all interrelated, one leading to another in a never-ending cycle of abstractions. I decided that showing these interconnections might be a good way to end this book. One of the most difficult aspects of category theory is the constant switching of perspectives. Take the category of sets, for instance. We are used to defining sets in terms of elements. An empty set has no elements. A singleton set has one element. A cartesian product of two sets is a set of pairs, and so on. But when talking about the category Set I asked you to forget about the contents of sets and instead concentrate on morphisms (arrows) between them. You were allowed, from time to time, to peek under the covers to see what a particular universal construction in Set described in terms of elements. The terminal object turned out to be a set with one element, and so on. But these were just sanity checks. A functor is defined as a mapping of categories. It’s natural to consider a mapping as a morphism in a category. A functor turned out to be a morphism in the category of categories (small categories, if we want to avoid questions about size). By treating a functor as an arrow, we forfeit the information about its action on the internals of a category (its objects and morphisms), just like we forfeit the information about the action of a function on elements of a set when we treat it as an arrow in Set. But functors between any two categories also form a category. This time you are asked to consider something that was an arrow in one category to be an object in another. 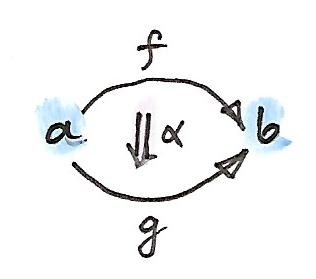 In a functor category functors are objects and natural transformations are morphisms. We have discovered that the same thing can be an arrow in one category and an object in another. The naive view of objects as nouns and arrows as verbs doesn’t hold. Instead of switching between two views, we can try to merge them into one. This is how we get the concept of a 2-category, in which objects are called 0-cells, morphisms are 1-cells, and morphisms between morphisms are 2-cells. 0-cells a, b; 1-cells f, g; and a 2-cell α. The category of categories Cat is an immediate example. We have categories as 0-cells, functors as 1-cells, and natural transformations as 2-cells. The laws of a 2-category tell us that 1-cells between any two 0-cells form a category (in other words, C(a, b) is a hom-category rather than a hom-set). This fits nicely with our earlier assertion that functors between any two categories form a functor category. In particular, 1-cells from any 0-cell back to itself also form a category, the hom-category C(a, a); but that category has even more structure. Members of C(a, a) can be viewed as arrows in C or as objects in C(a, a). As arrows, they can be composed with each other. But when we look at them as objects, the composition becomes a mapping from a pair of objects to an object. In fact it looks very much like a product — a tensor product to be precise. This tensor product has a unit: the identity 1-cell. It turns out that, in any 2-category, a hom-category C(a, a) is automatically a monoidal category with the tensor product defined as composition of 1-cells. Associativity and unit laws simply fall out from the corresponding category laws. Let’s see what this means in our canonical example of a 2-category Cat. The hom-category Cat(a, a) is the category of endofunctors on a. Endofunctor composition plays the role of a tensor product in it. The identity functor is the unit with respect to this product. We’ve seen before that endofunctors form a monoidal category (we used this fact in the definition of a monad), but now we see that this is a more general phenomenon: endo-1-cells in any 2-category form a monoidal category. We’ll come back to it later when we generalize monads. Identity law in a bicategory holds up to isomorphism (an invertible 2-cell ρ). We can do the same for the left identity and associativity laws. This kind of relaxed 2-category is called a bicategory (there are some additional coherency laws, which I will omit here). As expected, endo-1-cells in a bicategory form a general monoidal category with non-strict laws. which is universal among all such objects. A morphism between two spans that share the same endpoints is defined as a morphism h between their apices, such that the appropriate triangles commute. To summarize, in the bicategory Span: 0-cells are sets, 1-cells are spans, 2-cells are span morphisms. An identity 1-cell is a degenerate span in which all three objects are the same, and the two morphisms are identities. We’ve seen another example of a bicategory before: the bicategory Prof of profunctors, where 0-cells are categories, 1-cells are profunctors, and 2-cells are natural transformations. The composition of profunctors was given by a coend. We recognize these as the two operations defining a monad (they are called return and join in Haskell), and we know that monoid laws turn to monad laws. satisfying the monoid laws. We call this a monad. That’s a much more general definition of a monad using only 0-cells, 1-cells, and 2-cells. It reduces to the usual monad when applied to the bicategory Cat. But let’s see what happens in other bicategories. We say that a2 and a1 are “composable,” because the domain of one is the codomain of the other. The 2-cell μ is a function that maps a pair of composable arrows (a1, a2) to a single arrow a3 from Ar. In other words μ defines composition of arrows. It’s easy to check that monad laws correspond to identity and associativity laws for arrows. We have just defined a category (a small category, mind you, in which objects and arrows form sets). So, all told, a category is just a monad in the bicategory of spans. What is amazing about this result is that it puts categories on the same footing as other algebraic structures like monads and monoids. There is nothing special about being a category. It’s just two sets and four functions. In fact we don’t even need a separate set for objects, because objects can be identified with identity arrows (they are in one-to-one correspondence). So it’s really just a set and a few functions. Considering the pivotal role that category theory plays in all of mathematics, this is a very humbling realization. Derive unit and associativity laws for the tensor product defined as composition of endo-1-cells in a bicategory. Check that monad laws for a monad in Span correspond to identity and associativity laws in the resulting category. Show that a monad in Prof is an identity-on-objects functor. What’s a monad algebra for a monad in Span? This is part 30 of Categories for Programmers. Previously: Topoi. See the Table of Contents. Nowadays you can’t talk about functional programming without mentioning monads. But there is an alternative universe in which, by chance, Eugenio Moggi turned his attention to Lawvere theories rather than monads. Let’s explore that universe. There are many ways of describing algebras at various levels of abstraction. We try to find a general language to describe things like monoids, groups, or rings. At the simplest level, all these constructions define operations on elements of a set, plus some laws that must be satisfied by these operations. For instance, a monoid can be defined in terms of a binary operation that is associative. We also have a unit element and unit laws. But with a little bit of imagination we can turn the unit element to a nullary operation — an operation that takes no arguments and returns a special element of the set. If we want to talk about groups, we add a unary operator that takes an element and returns its inverse. There are corresponding left and right inverse laws to go with it. A ring defines two binary operators plus some more laws. And so on. The big picture is that an algebra is defined by a set of n-ary operations for various values of n, and a set of equational identities. These identities are all universally quantified. The associativity equation must be satisfied for all possible combinations of three elements, and so on. Incidentally, this eliminates fields from consideration, for the simple reason that zero (unit with respect to addition) has no inverse with respect to multiplication. The inverse law for a field can’t be universally quantified. A nullary operation is a morphism from the terminal object (the zeroth power of a). So all we need in order to define any algebra is a category whose objects are powers of one special object a. The specific algebra is encoded in the hom-sets of this category. This is a Lawvere theory in a nutshell. Category of finite sets FinSet. Lawvere theory L: an object in the category Law. Model M of a Lawvere category: an object in the category Mod(Law, Set). All Lawvere theories share a common backbone. All objects in a Lawvere theory are generated from just one object using products (really, just powers). But how do we define these products in a general category? It turns out that we can define products using a mapping from a simpler category. In fact this simpler category may define coproducts instead of products, and we’ll use a contravariant functor to embed them in our target category. 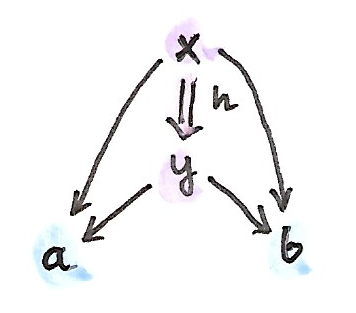 A contravariant functor turns coproducts into products and injections to projections. However, even though it’s natural to think that there’s only one empty set, there may be many distinct singleton sets. In particular, the set 1 + 0 is different from the set 0 + 1, and different from 1 — even though they are all isomorphic. The coproduct in the category of sets is not associative. We can remedy that situation by building a category that identifies all isomorphic sets. Such a category is called a skeleton. In other words, the backbone of any Lawvere theory is the skeleton F of FinSet. The objects in this category can be identified with natural numbers (including zero) that correspond to the element count in FinSet. Coproduct plays the role of addition. Morphisms in F correspond to functions between finite sets. For instance, there is a unique morphism from 0 to n (empty set being the initial object), no morphisms from n to 0 (except 0->0), n morphisms from 1 to n (the injections), one morphism from n to 1, and so on. Here, n denotes an object in F corresponding to all n-element sets in FinSet that have been identified through isomorphims. You may sometimes see this functor characterized as identity-on-objects, which means that the objects in F and L are the same. We will therefore use the same names for them — we’ll denote them by natural numbers. Keep in mind though that objects in F are not the same as sets (they are classes of isomorphic sets). The hom-sets in L are, in general, richer than those in Fop. They may contain morphisms other than the ones corresponding to functions in FinSet (the latter are sometimes called basic product operations). Equational laws of a Lawvere theory are encoded in those morphisms. The key observation is that the singleton set 1 in F is mapped to some object that we also call 1 in L, and all the other objects in L are automatically powers of this object. For instance, the two-element set 2 in F is the coproduct 1+1, so it must be mapped to a product 1×1 (or 12) in L. In this sense, the category F behaves like the logarithm of L.
as the prototype for a function of n variables that ignores all but the k’th variable. Conversely, constant morphisms n->1 in F become diagonal morphisms 1->1n in L. They correspond to duplication of variables. The interesting morphisms in L are the ones that define n-ary operations other than projections. It’s those morphisms that distinguish one Lawvere theory from another. These are the multiplications, the additions, the selections of unit elements, and so on, that define the algebra. But to make L a full category, we also need compound operations n->m (or, equivalently, 1n -> 1m). Because of the simple structure of the category, they turn out to be products of simpler morphisms of the type n->1. This is a generalization of the statement that a function that returns a product is a product of functions (or, as we’ve seen earlier, that the hom-functor is continuous). Lawvere theory L is based on Fop, from which it inherits the “boring” morphisms that define the products. It adds the “interesting” morphisms that describe the n-ary operations (dotted arrows). Morphisms between Lawvere theories encapsulate the idea of the interpretation of one theory inside another. For instance, group multiplication may be interpreted as monoid multiplication if we ignore inverses. The simplest trivial example of a Lawvere category is Fop itself (corresponding to the choice of the identity functor for IL). This Lawvere theory that has no operations or laws happens to be the initial object in Law. At this point it would be very helpful to present a non-trivial example of a Lawvere theory, but it would be hard to explain it without first understanding what models are. Notice that we require the preservation of products only up to isomorphism. This is very important, because strict preservation of products would eliminate most interesting theories. As with any functor, it’s possible that multiple morphisms in L are collapsed to the same function in Set. Incidentally, the fact that all laws are universally quantified equalities means that every Lawvere theory has a trivial model: a constant functor mapping all objects to the singleton set, and all morphisms to the identity function on it. 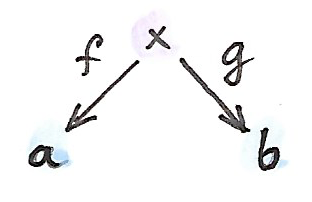 where b = N 1.
where f :: n -> 1 is an n-ary operation in L.
The functors that define models form a category of models, Mod(L, Set), with natural transformations as morphisms. Consider a model for the trivial Lawvere category Fop. Such model is completely determined by its value at 1, M 1. Since M 1 can be any set, there are as many of these models as there are sets in Set. Moreover, every morphism in Mod(Fop, Set) (a natural transformation between functors M and N) is uniquely determined by its component at M 1. Conversely, every function M 1 -> N 1 induces a natural transformation between the two models M and N. Therefore Mod(Fop, Set) is equivalent to Set. The simplest nontrivial example of a Lawvere theory describes the structure of monoids. 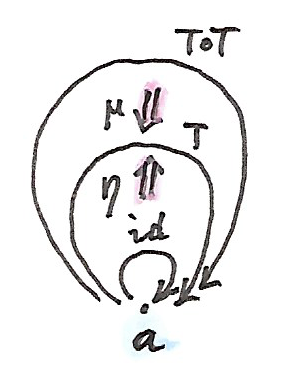 It is a single theory that distills the structure of all possible monoids, in the sense that the models of this theory span the whole category Mon of monoids. We’ve already seen a universal construction, which showed that every monoid can be obtained from an appropriate free monoid by identifying a subset of morphisms. So a single free monoid already generalizes a whole lot of monoids. There are, however, infinitely many free monoids. The Lawvere theory for monoids LMon combines all of them in one elegant construction. Every monoid must have a unit, so we have to have a special morphism η in LMon that goes from 0 to 1. Notice that there can be no corresponding morphism in F. Such morphism would go in the opposite direction, from 1 to 0 which, in FinSet, would be a function from the singleton set to the empty set. No such function exists. Next, consider morphisms 2->1, members of LMon(2, 1), which must contain prototypes of all binary operations. When constructing models in Mod(LMon, Set), these morphisms will be mapped to functions from the cartesian product M 1 × M 1 to M 1. In other words, functions of two arguments. The question is: how many functions of two arguments can one implement using only the monoidal operator. Let’s call the two arguments a and b. There is one function that ignores both arguments and returns the monoidal unit. Then there are two projections that return a and b, respectively. They are followed by functions that return ab, ba, aa, bb, aab, and so on… In fact there are as many such functions of two arguments as there are elements in the free monoid with generators a and b. Notice that LMon(2, 1) must contain all those morphisms because one of the models is the free monoid. In a free monoid they correspond to distinct functions. Other models may collapse multiple morphisms in LMon(2, 1) down to a single function, but not the free monoid. If we denote the free monoid with n generators n*, we may identify the hom-set L(2, 1) with the hom-set Mon(1*, 2*) in Mon, the category of monoids. In general, we pick LMon(m, n) to be Mon(n*, m*). In other words, the category LMon is the opposite of the category of free monoids. The category of models of the Lawvere theory for monoids, Mod(LMon, Set), is equivalent to the category of all monoids, Mon. As you may remember, algebraic theories can be described using monads — in particular algebras for monads. It should be no surprise then that there is a connection between Lawvere theories and monads. First, let’s see how a Lawvere theory induces a monad. It does it through an adjunction between a forgetful functor and a free functor. The forgetful functor U assigns a set to each model. This set is given by evaluating the functor M from Mod(L, Set) at the object 1 in L.
It can be shown that so defined U always has a left adjoint, the free functor F.
Together, the forgetful and the free functor define a monad T = U∘F on Set. Thus every Lawvere theory generates a monad. It turns out that the category of algebras for this monad is equivalent to the category of models. You may recall that monad algebras define ways to evaluate expressions that are formed using monads. A Lawvere theory defines n-ary operations that can be used to generate expressions. Models provide means to evaluate these expressions. Since the coend generalizes a coproduct, or a sum, this formula is a generalization of a power series expansion. Or we can use the intuition that a functor is a generalized container. In that case a finitary container of as can be described as a sum of shapes and contents. Here, F n is a set of shapes for storing n elements, and the contents is an n-tuple of elements, itself an element of an. 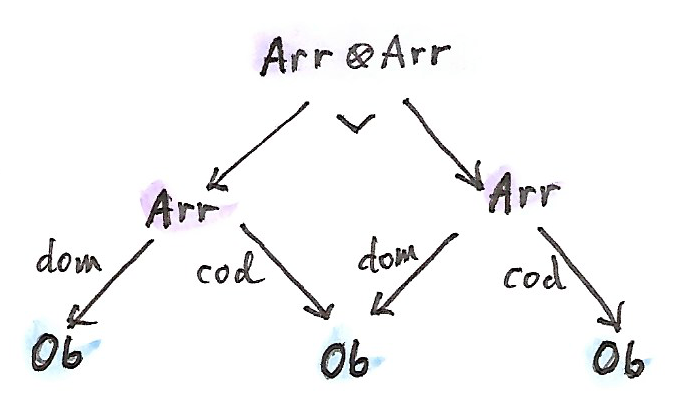 For instance, a list (as a functor) is finitary, with one shape for every arity. A tree has more shapes per arity, and so on. The category opposite to this Kleisli category, KlTop, restricted to finite sets, is the Lawvere theory in question. In particular, the hom-set L(n, 1) that describes n-ary operations in L is given by the hom-set KlT(1, n). It turns out that most monads that we encounter in programming are finitary, with the notable exception of the continuation monad. It is possible to to extend the notion of Lawvere theory beyond finitary operations. Let’s explore the coend formula in more detail. The lifting simply selects m elements from a tuple of n elements (a1, a2,...an) (possibly with repetitions). For instance, let’s take fk :: 1 -> n — a selection of the kth element from an n-element set. It lifts to a function that takes a n-tuple of elements of a and returns the kth one. You might notice that it’s not immediately obvious that the profunctor in question is covariant in the second argument. The hom-functor L(m, 1) is actually contravariant in m. However, we are taking the coend not in the category L but in the category F. The coend variable n goes over finite sets (or the skeletons of such). 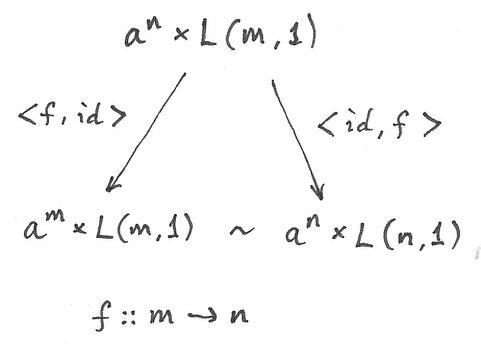 The category L contains the opposite of F, so a morphism m -> n in F is a member of L(n, m) in L (the embedding is given by the functor IL). Let’s check the functoriality of L(m, 1) as a functor from F to Set. We want to lift a function f :: m -> n, so our goal is to implement a function from L(m, 1) to L(n, 1). 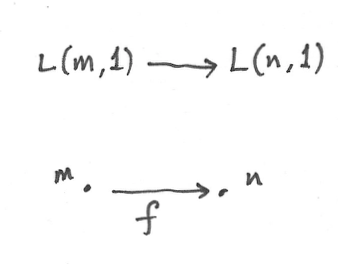 Corresponding to the function f there is a morphism in L from n to m (notice the direction). Precomposing this morphism with L(m, 1) gives us a subset of L(n, 1). Notice that, by lifting a function 1->n we can go from L(1, 1) to L(n, 1). We’ll use this fact later on. The product of a contravariant functor an and a covariant functor L(m, 1) is a profunctor Fop×F->Set. 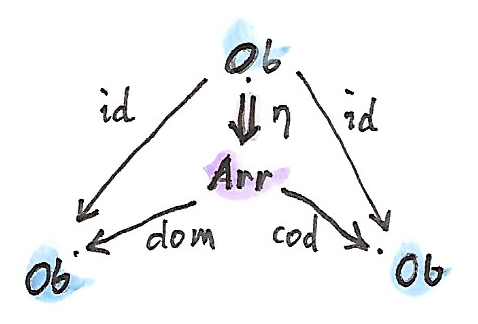 Remember that a coend can be defined as a coproduct (disjoint sum) of all the diagonal members of a profunctor, in which some elements are identified. The identifications correspond to cowedge conditions. Here, the coend starts as the disjoint sum of sets an × L(n, 1) over all ns. The identifications can be generated by expressing the coend as a coequilizer. We start with an off-diagonal term an × L(m, 1). To get to the diagonal, we can apply a morphism f :: m -> n either to the first or the second component of the product. The two results are then identified. when we lift <id, f>. This doesn’t mean, however, that all elements of an × L(n, 1) can be identified with a × L(1, 1). That’s because not all elements of L(n, 1) can be reached from L(1, 1). Remember that we can only lift morphisms from F. A non-trivial n-ary operation in L cannot be constructed by lifting a morphism f :: 1 -> n.
In other words, we can only identify all addends in the coend formula for which L(n, 1) can be reached from L(1, 1) through the application of basic morphisms. They are all equivalent to a × L(1, 1). Basic morphisms are the ones that are images of morphisms in F.
which is the identity monad. Since there is such a strong connection between monads and Lawvere theories, it’s natural to ask the question if Lawvere theories could be used in programming as an alternative to monads. The major problem with monads is that they don’t compose nicely. There is no generic recipe for building monad transformers. Lawvere theories have an advantage in this area: they can be composed using coproducts and tensor products. On the other hand, only finitary monads can be easily converted to Lawvere theories. The outlier here is the continuation monad. There is ongoing research in this area (see bibliography). To give you a taste of how a Lawvere theory can be used to describe side effects, I’ll discuss the simple case of exceptions that are traditionally implemented using the Maybe monad. by lifting 0->n in two different ways. Notice that this Lawvere theory only supports the raising of exceptions, not their handling. Next: Monads, Monoids, and Categories. Enumarate all morphisms between 2 and 3 in F (the skeleton of FinSet). Show that the category of models for the Lawvere theory of monoids is equivalent to the category of monad algebras for the list monad. The Lawvere theory of monoids generates the list monad. Show that its binary operations can be generated using the corresponding Kleisli arrows. FinSet is a subcategory of Set and there is a functor that embeds it in Set. Any functor on Set can be restricted to FinSet. Show that a finitary functor is the left Kan extension of its own restriction. I’m grateful to Gershom Bazerman for many useful comments. Abstract: I present a uniform derivation of profunctor optics: isos, lenses, prisms, and grates based on the Yoneda lemma in the (enriched) profunctor category. In particular, lenses and prisms correspond to Tambara modules with the cartesian and cocartesian tensor product. This blog post is the result of a collaboration between many people. The categorical profunctor picture solidified after long discussions with Edward Kmett. A lot of the theory was developed in exchanges on the Lens IRC channel between Russell O’Connor, Edward Kmett and James Deikun. They came up with the idea to use the Pastro functor to freely generate Tambara modules, which was the missing piece that completed the picture. My interest in lenses started long time ago when I first made the connection between the universal quantification over functors in the van Laarhoven representation of lenses and the Yoneda lemma. Since I was still learning the basics of category theory, it took me a long time to find the right language to make the formal derivation. Unbeknownst to me Mauro Jaskellioff and Russell O’Connor independently had the same idea and they published a paper about it soon after I published my blog. But even though this solved the problem of lenses, prisms still seemed out of reach of the Yoneda lemma. Prisms require a more general formulation using universal quantification over profunctors. I was able to put a dent in it by deriving Isos from profunctor Yoneda, but then I was stuck again. I shared my ideas with Russell, who reached for help on the IRC channel, and a Haskell proof of concept was quickly established. Two years later, after a brainstorm with Edward, I was finally able to gather all these ideas in one place and give them a little categorical polish. 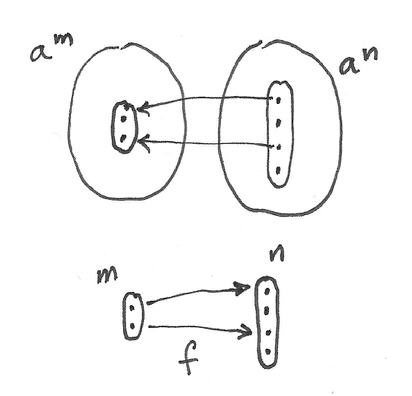 Here, f is a member of the functor category [C, Set], where natural transformation form hom-sets. This form of the Yoneda lemma is useful in showing the Yoneda embedding, which states that any category C can be fully and faithfully embedded in the functor category [C, Set]. The embedding is a functor, and the above formula defines its action on morphisms. In Haskell, you may think of f and g as type constructors (with the corresponding Functor instances), in which case L and R are types that are parameterized by these type constructors (similar to how the monad or functor classes are). 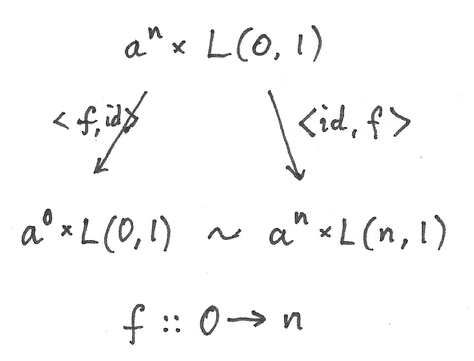 Notice that the composition R ∘ L of adjoint functors is a monad in C. Let’s write this monad as Φ. The end is taken over x in a category D that has some additional structure (we’ll see examples of that later); but the hom-sets are in the underlying simpler category C, which is the target of the forgetful functor U. Here, Φ is the monad R ∘ L in the category of functors. You may think of this formula as defining the trivial kind of optic that simply turns a to s.
I have replaced a with a pair <a, b> and s with a pair <s, t>. The end is taken over all profunctors that exhibit some structure that U forgets, and F freely creates. 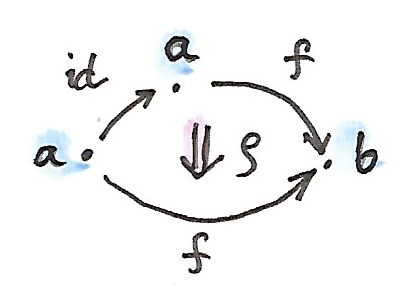 Φ is the monad U ∘ F. It’s a monad that acts on profunctors to produce other profunctors. the first one going in the opposite direction. Interesting things happen when we impose more structure on our profunctors. Notice that we use a tensor product of categories. The objects in such a category are pairs of objects, and the hom-objects are tensor products of individual hom-objects. The definition of composition in a product category requires that the tensor product in V be symmetric (up to isomorphism). We are assuming that V is closed, so the internal hom is defined for every pair of objects. is an enriched hom functor mapping pairs of objects in A to objects in V, plus the appropriate action on hom-objects. This hom-functor is the profunctor on which Φ acts. An enriched category A may have a monoidal structure of its own. 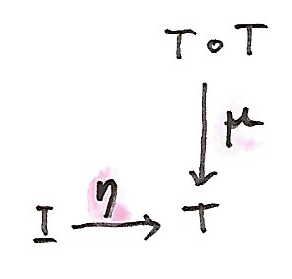 We’ll use the same tensor product notation for its structure as we did for the underlying monoidal category V. There is also a tensorial unit object i in A. Notice that these are morphisms in the underlying category V, which is also the target of the profunctor. Strictly speaking one can separately define left and right action but, for simplicity, we’ll assume that the product is symmetric (up to isomorphism). The intuition behind Tambara modules is that some of the profunctor values are not independent of others. Once we have calculated p x y, we can obtain the value of p at any of the points on the path <a⊗x, a⊗y> by applying α.
is itself a profunctor Vop×V -> V, so it can be used to lift pairs of morphisms in V.
Since we want our hom-object to satisfy the above condition for any triple, we have to construct it as an intersection of all those equalizers. Here, an intersection means an object of V together with a family of monomorphisms, each embedding it into a particular equalizer. 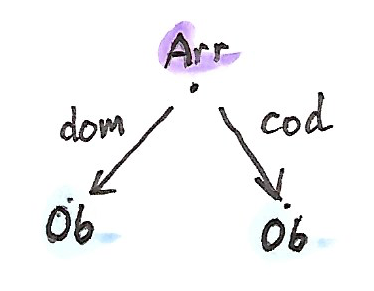 It’s possible to construct a forgetful functor from the Tambara category to the category of profunctors [Aop⊗A, V]. It forgets the existence of α and it maps hom-objects between the two categories. Composition in the Tambara category is defined is such a way as to be compatible with this forgetful functor. The fact that Tambara modules form a category is important, because we want to be able to use the Yoneda lemma in that category. 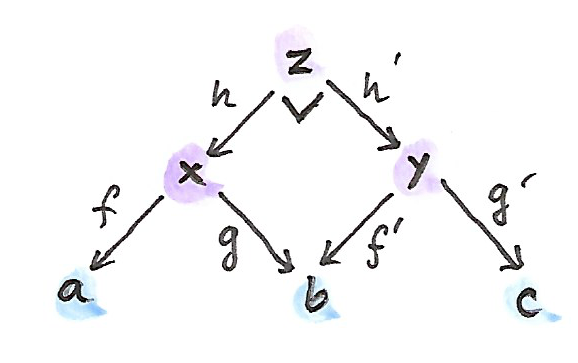 The key observation is that the forgetful functor from the Tambara category has a left adjoint, and that their composition forms a monad in the category of profunctors. We’ll plug this monad into our general formula. For a given profunctor p, this comonad builds a new profunctor that is essentially a gigantic product of all values of this profunctor “shifted” by tensoring its arguments with all possible objects c.
Notice that we have two separate tensor products in this formula: one in V, between the hom-objects and the profunctor, and one in A, under the hom-objects. This monad takes an arbitrary profunctor p and produces a new profunctor Φ p.
where the end on the left is taken over all Tambara modules, and U is the forgetful functor from the Tambara category to the category of profunctors. The former is equivalent to what it called a Strong (or Cartesian) profunctor in Haskell, the latter is equivalent to a Choice (or Cocartesian) profunctor. These are the well-known existential representations of lenses and prisms. which are special cases of the comonad Θ.
It’s interesting that the work on Tambara modules has relevance to Haskell optics. It is, however, just one example of an even larger pattern. This requirement picks a class of profunctors that we call Related. Why are profunctors relevant as carriers of symmetry? It’s because they generalize a relationship between objects. The profunctor transformation law essentially says that if two objects a and b are related through p then so are the transformed objects; and that there is a function α that relates the proofs of this relationship. This is in the spirit of profunctors as proof-relevant relations. As an analogy, imagine that we are comparing people, and the transformation we’re interested in is aging. We notice that family relationships remain invariant under aging: if a is a sibling of b, they will remain siblings as they age. This is not true about other relationships, for instance being a boss of another person. But family bonds are not the only ones that survive the test of time. Another such relation is being older or younger than the other person. Now imagine that you pick four people at random points in time and you find out that any time-invariant relation between two of them, a and b, also holds between s and t. You have to conclude that there is some connection between s and age-adjusted a, and between age-adjusted b and t. In other words there exists a time shift that transforms one pair to another. The end is a generalization of a product, so it’s enough that one of the components is empty for the whole end to be empty. It means that, for a particular choice of the four types a, b, s, and t, we have to be able to construct a whole family of morphisms, one for every p. We have seen that this end exists only if the four types are connected in a very peculiar way — for instance, if a and b are somehow embedded in s and t.
because there is a family of appropriate morphisms: our αf a b. In general, though, we can get away with weaker connection. These morphisms assert that s can be split into a pair, and that t can be constructed from a pair (but not the other way around). Notice that, unlike the case of Tambara modules, this family is parameterized by a contravariant parameter e.
This is very similar to the existential representation of a lens or a prism. It has the intuitive interpretation that s can be thought of as a container of a‘s indexed by some hidden type c.
I find it fascinating that constructions that were first discovered in Haskell to make Haskell’s optics composable have their categorical counterparts. This was not at all obvious, if only because some of them use parametricity arguments. 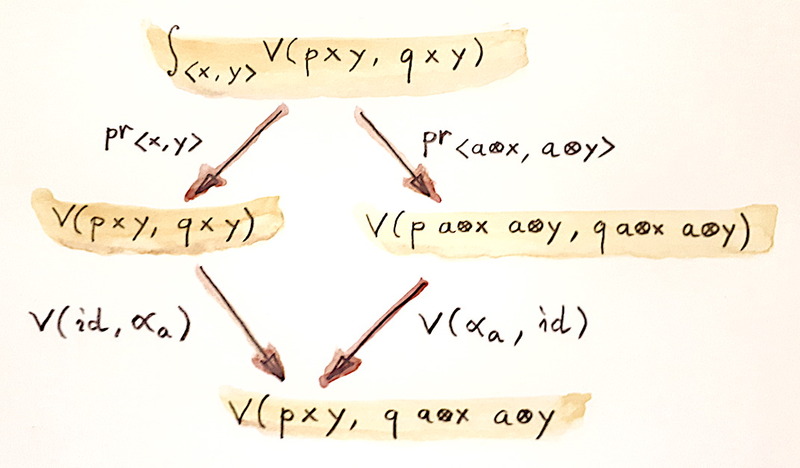 Parametricity is the property of the language, not easily translatable to category theory. Now we know that the profunctor formulation of isos, lenses, prisms, and grates follows from the Yoneda lemma. The work is not complete yet. I haven’t been able to derive the same formulation for traversals, which combine two different tensor products plus some monoidal constraints.